Over a career that spanned half of a century, Henry Louis Mencken published more than 10 million words. More than a million were written about him, many of which, Mencken liked to remark, were highly condemnatory. He was called, with good reason, the most powerful private citizen in America during the 1920s. This lively introduction to Mencken’s life and work begins with a concise biographical portrait before proceeding to a consideration of the five major periods of the renowned Baltimorean’s career: his literary apprenticeship; the growth of his national reputation; his fame and unprecedented popularity during the 1920s (when college students would flash the Paris-green cover of the American Mercury as a badge of sophistication); the decline of his reputation during the Depression; and his renewed popularity during the 1940s, with the publication of his autobiographical trilogy, the Days books. 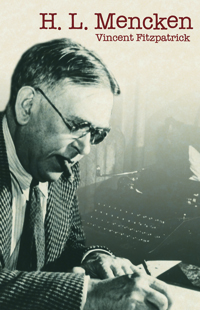 In discussing this varied career, Vincent Fitzpatrick touches upon all the roles that Mencken played: journalist; editor; redoubtable critic of literature, culture, and politics; philologist; and autobiographer. Drawing upon Mencken’s extensive correspondence of more than 100,000 letters, the book stresses his unflagging belief in the need for free speech (up to the limits of common decency). Indeed, in the end Mencken proved a significant American civil libertarian. Iconoclast, critic, satirist, "individualist," H. L. Mencken offered unique insights into American life. His lifelong celebration of the freedom to dissent marks his most enduring contribution to a nation that gave him such a wealth of material and so much delight.